There are a variety of humour. There is a kind of humor is called in English HUMOUR. This is pure belles-lettres. There is a kind of humor which is necessary to create the sparkle and creates the humor through the penetrating, scholarship or cleverly. To create a humour, one important way the quiz. Today sharable collection book is Bangladesher Nirbachito Romyo Rachona O Gaplo. 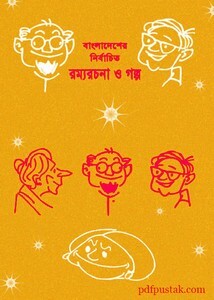 The Bangla book has 78 pages, 3mb file size, the book edited by Ahamad Mazahar and scan by Shishir Suvro. Readers have not any permission to share, read, sell or download any copyrighted book. 'pdfpustak.com' always respect the Copyright law and we want that all readers follow the copyright laws and they should not use eBook for dishonest purpose. It's good to say that, any pdf book is not directly hosted in the website.